Note: The Canon Speedlite 580EX II Flash has been replaced by the Canon Speedlite 600EX-RT Flash. Accessory flashes such as Canon Speedlite 580EX II Flash are some of the most important pieces of equipment in my kit. The 580EX II is Canon's top-of-the-line, professional grade external flash - There are very few features missing in this one. The 580EX II announcement was a surprise to me - I was surprised to hear that the not very old Canon Speedlite 580EX Flash was being replaced already. And the first thing we need to deal with regarding this new flash is the name - The original flash was touting its ETTL-"II" capabilities in its name and now we have the 580EX "II" - which is still E-TTL II. 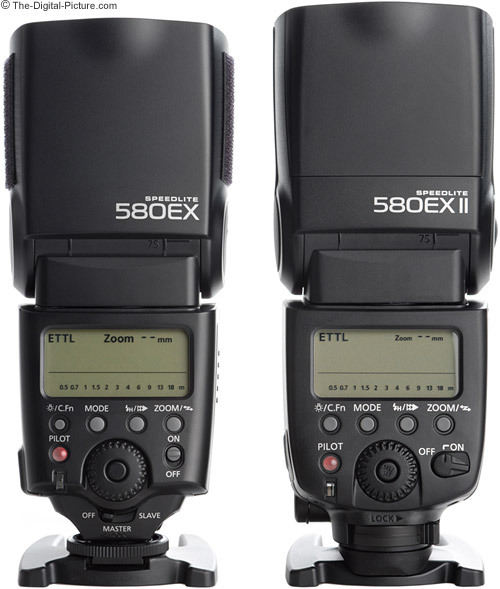 (For the purposes of this review, 580EX refers to the original 580EX). As I am writing this, I need to personally decide if I will replace my three 580EX flashes with the new version. And since image quality is ultimately important to me, my biggest concern is what my flash-exposed shots look like. So, getting down to business ... Since the flash head working area size is nearly identical between the two flashes, original size of the light thrown by them is going to be the same. The amount of light thrown; however, is always the question. How well does the E-TTL exposure work? As usual, I shot a lot of direct comparison tests for this review. Using my original 580EX flashes and a new 580EX II, I tested various scenario, camera, lens and setting combinations (including the Canon EOS-1D Mark II DSLR, Canon 1D Mark III DSLR, Canon EF 24-105mm f/4 L IS USM Lens and Canon EF 50mm f/1.2 L USM Lens). With the camera in M mode, the 580EX II is giving me images that are .3 stops darker on average - with a rather small standard deviation. I didn't notice any change in exposure comparisons with the flash head in the bounce position. Of course, a little flash exposure compensation results in identical results in most circumstances. The biggest deviation occurred in a frame mostly filled with a black subject that had white highlights. In this scenario, the original 580EX completely blew the highlights, while the 580EX II exposed at over 1.5 stops lower - slightly too low, but retaining the highlights. In nearly all cases, would pick the 580EX II exposure over the 580EX without FEC by a slight margin. The 580EX II recycles approximately 20% faster than the 580EX. What is more noticeable to me is the lack of sound during the recharging phase. I've grown accustomed to listening to the whine of the charging flashes - I can audibly tell when they are at full power and know when the batteries are nearing the end of their charge. I definitely like the new, very-professional quiet charging, but I need to relearn my flash-ready indicators. I'm told "they switched the voltage boost oscillator to an ultrasonic frequency". I should note that the flash is not sound-free as the zoom flash head still makes noise. The flash head zoom noise is higher-pitched. I wouldn't call it louder, but it is possibly more noticeable sometimes. The 580EX II sports a more-rugged build quality with a metal foot being one of the most noticeable changes. But the good news/bad news is that the metal foot is attached to a plastic mount inside the flash. Bad in that it will still be the part that breaks, but good that your camera likely will not be the part that breaks (a broken flash beats a broken camera any day from my perspective). The metal will certainly hold up better to repeated mounting/dismounting. 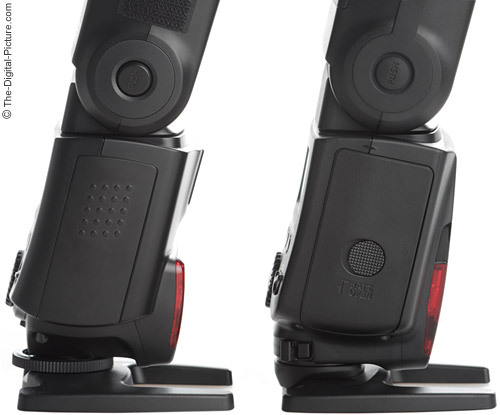 The long-time standard plastic foot is shown above left - the new metal 580EX II metal foot is shown above right. Visible dust and water resistance indicators denote another update this flash has received. This is Canon's first weather-resistant flash. Dust and water resistance is a feature that is going to be in heavy demand from sports and photojournalism photographers. The final sealing at the camera's hot shoe requires the changes implemented in the announced-at-the-same-time and appealing-to-the-same-photographers Canon EOS-1D Mark III Digital SLR. Users of older and non-sealed bodies will not get this final sealing protection, though the rest of the flash is sealed. A little tape can probably remedy this issue for older weather-sealed bodies. Rubber covers seal the external ports - for external power and the new, greatly needed receive-only PC terminal - Pocket Wizard RF remote users know what this port does for them. The PC terminal is located just above the foot on the flash's left side. The long-time standard large round foot locking screw (above left) has been replaced with a very nice lever lock (above right). Simply thumb slide the lever from left to right until it clicks into locked position. Feet lower to tighten the flash solidly onto the hot shoe and the locking pin is lowered. A lock release button is located just to the right of the lever making unlocking easy. The new lever is faster to use - I like it. What is not faster to use - what I don't like - is the now-menu-located off/master/slave remote flash setting (notice the switch is missing in the above picture - more about this function later). To get to this menu setting requires the zoom button to be held for 2 seconds - I could change the old switch in much less time than it now takes just to pull up the menu setting. Newer Canon DSLR bodies have the ability to control the flash from their menus - this becomes the easier method of controlling this flash option. Note: the adhesive Velcro shown on the original 580EX (above left) is an accessory used to hold certain flash modifiers in place. There are many subtle changes in size/shape/texture in the new Canon Speedlite 580EX II Flash. As can be seen in the comparison pictures throughout this review, the new flash is slightly larger/bulkier than the older flash. The reshaped flash body immediately reminded me of the 580EX's predecessor, the Canon Speedlite 550EX. Small changes include a repositioned wireless slave sensor and a reconfigured AF assist beam emitter - which now includes a small round hole containing the Auto and Manual External metering sensor. The 580EX II weighs 1 lb 2.6 oz (525g) with 4 NiMH batteries installed compared to 1 lb 1.4 oz (490g) for the 580EX (actual tested weights). The 580EX II sports a new power switch design - this one rotates instead of sliding. The new one is a little nicer (and likely easier to seal), but the physical change is not significant from a user perspective. The flash body finish is slightly more-textured than that of the 580EX. Those of you familiar with Canon's recent flashes will correctly recognize Auto and Manual External metering as being new. Tell the 580EX your camera's ISO and aperture (F/stop) settings and it will calculate its own flash output. The built-in meter measures reflected light and turns off the flash when the proper amount is detected. To use the Auto External ("E") mode, a compatible body must be used - the Canon EOS-1D Mark III Digital SLR is the first to offer this feature. Compatible cameras will pass the ISO and aperture to the flash "auto"matically. Other body users can still use external metering, but will need to use the External Manual ("EM") mode which requires the camera settings to be manually entered into the flash. Metered (off a gray card) manual flash is also available. A custom function menu setting is used to select the external metering modes. High speed synch is not available and no preflash is fired in the external metering modes. My comparisons showed external metering, even from a 1D Mark III, to be significantly underexposed (typically 1.5 stops or so) unless the subject was very dark. Of course, the normal E-TTL-II (or ETTL), TTL and M modes are still present. E-TTL II and the previous E-TTL are Electronic-Through-the-Lens metering modes that fire a preflash to determine how powerful the immediately-following actual flash needs to be. This is Canon's very easy-to-use automatic flash. Some people love it and some don't (I personally like it very much). E-TTL is compatible "with all EOS digital SLRs; PowerShot G2, G3, G5, G6, G7 and Pro1; and the following EOS film cameras - EOS-1v, EOS-3, Elan 7N series, Elan 7 series, Elan II series, Rebel T2, Ti, K2, GII, G. Non-electronic TTL operation is compatible with all other 35mm EOS film SLRs and the Canon T90." And likely many more models by the time the 580EX II is retired. ETTL II advances E-TTL by incorporating distance information from newer Canon lenses into flash exposure calculation. This flash also passes color information to the camera. The E-TTL/E-TTL II flash output is dependant on the camera mode being used. I primarily shoot with my camera in M mode or Av mode. With the camera in M mode, the flash will provide the light necessary to get a proper exposure. This is the easiest mode to use for flash as the main light - stopping even the fastest action in the dark. In Av mode, the camera will set its exposure for the ambient light level and the flash will provide fill/subject light. Camera and subject motion can be issues in this mode - unless a custom function (provided only on some cameras) is selected to increase the shutter speed. Tv mode is similar to Av mode. I'll let you explore the rest of the modes available on your camera (see your camera's manual). One more flash mode: Manual mode. If your subject distance is consistent (formal portraits for example), a manual flash output setting can eliminate shot-to-shot exposure variations. Using the control dial, it is easy and fast to set manual flash power output. Manual flash output can be controlled in 1/3 stop increments - 1/1, 1/2, 1/4, 1/8th, 1/16th, 1/32nd, 1/64th & 1/128th. Become familiar with this mode. Another interesting mode available on the Canon Speedlite 580EX II Flash is Multi Mode - or Stroboscopic flash. In this mode, the 580EX II fires a rapid series of flashes as setup in the menu. Unleash your creativity with this one. Modeling flash is available with the DOF Preview button. In addition to being the first camera to support the Auto External mode, the EOS 1D Mark III is also the first to be able to control the 580EX II's custom functions settings from its own menu. This is a very nice feature. Communications reliability is supposed to be improved though I can't say if it has or hasn't as I haven't had problems with camera/flash communications in the past. I'm sure a dry foot/shoe connection is going to help when compatible cameras are used. More physical changes ... Every time I change batteries in the 580EX (above left), I have this little fear that I am going to break the battery door off while trying to get it open. Fear no more - the 580EX II has a new door (above right). Slide the round button sideways and then down - the battery door springs up for clear access to the 2x2 square (not staggered) oriented AA batteries. This is the way it should have been in the first place. While on the battery topic ... The 580EX II is rated for approximately 100 to 700 shots from new AA-size alkaline batteries which deliver a fast recycling time of approximately 0.1 to 6 seconds. For quick flash (firing a not-completely-charged flash), recycle times range from .1-2.5 seconds - again from new AA-size alkaline batteries. Canon's manual states "Using size-AA batteries other than the alkaline type may cause improper battery contact due to the irregular shape of the battery contacts." A couple of bullets later, it states "Size-AA Ni-MH or lithium batteries can also be used." Don't use alkalines - NiMH batteries will save you lots of money and will work better. NiMH batteries have much less internal resistance than alkaline batteries resulting in significantly shorter re-cycle times (up to 50% faster). NiMH batteries also give more consistent (full) power until they are discharged while alkalines will recycle the flash more and more slowly as they expend their life. Adding environmental concerns and cost to this equation should make the decision to use NiMH batteries a no-brainer. Buy lots of them and use them in everything you own that accepts them (get a smart charger such as is made by Powerex). Eneloop AA batteries come highly recommended. A new-at-the-same-time weather-sealed Compact Battery Pack CP-E4 or the older non-sealed CP-E3 can be used for faster charging and more flashes-per-battery-change. Auto Power-Off on the Speedlite 580EX II normally kicks in after 90 seconds of inactivity when the flash is not set up as a slave unit. However, there is a thermistor inside the Speedlite that prevents the flash from firing when internal temperature exceeds a certain unspecified level. If the thermal cutoff kicks in, the flash cannot be fired until it cools down sufficiently. This usually takes about 15 minutes. C.Fn 14 disables Auto Power Off, but it does not disable the thermal cutoff. A total of 14 custom functions (C.Fn-00 through C.Fn-13) can be set on the flash. As can be expected from Canon's top-of-the-line flash, the Canon Speedlite 580EX II Flash features a wide range of controls including FEC (Flash Exposure Compensation), High Speed synch, FEB (Flash Exposure Bracketing), FEL (Flash Exposure Lock), first/second curtain synch ... Use High Speed synch when you need a shutter speed higher than your camera's max flash synch speed (typically 1/200 or 1/250) - such as outdoors with a decent amount of light. At certain shutter speeds, the second curtain starts to close before the first curtain is completely open - standard flash mode needs a wide open aperture for the instant it flashes light. In HS mode, the faster the shutter speed, the shorter the effective flash range will become. Use second curtain flash synch when taking an exposure with subject motion blur - the motion will flow to the end of the exposure which will be accented by the flash. FEC overrides the camera setting while other settings are determined by the location of the last adjustment. Like the 580EX, the 580EX II features a zoom-capable flash head. The zoom setting can be set manually (for creativity) or automatically by the camera communicating with the flash. Included in the communication is the FOVCF (1.0x, 1.3x or 1.6x) of the compatible digital camera body being used (film cameras are 1.0x/full frame). The zoom setting is optimized for the camera and lens being used - Less light is wasted, battery life is maximized. This means that the Canon EF-S 10-22mm USM Lens is supported on EF-S compatible Canon bodies. A lens wider than 24mm (or equivalent framing) requires the pull-out and flip-down diffuser panel to be used for complete frame flash coverage. A lens wider than 14mm (such as the Canon EF 15mm Fisheye Lens requires bounce flash or an accessory diffuser such as a Sto-Fen Omni-Bounce. Rotating the flash head to bounce position results in a 50mm zoom position. Using one button, the 580EX II head rotates 180 degrees to both sides as well as 90 degrees upward and 7 degrees downward. When using bounce flash, consider also using the retractable catch light panel. This is a white, semi-rigid plastic-like panel meant to create a bright reflection in the subject's eyes. The catchlight panel is only useful to a certain distance as the reflection size becomes too small to be useful at some point. 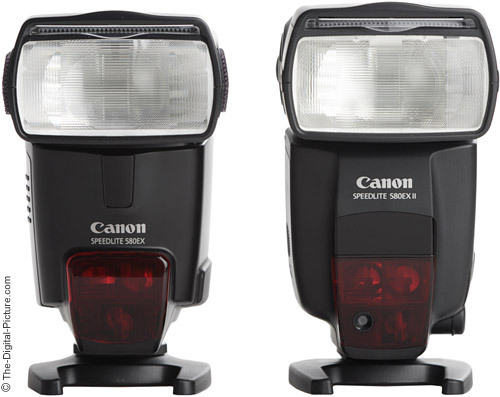 Canon's better Speedlite flashes include an AF-Assist Beam to enhance autofocus performance in low light conditions (see the red window on the front of the flash?). AF assist projects a red pattern of light that creates enough contrast for the camera to autofocus on even a solid-colored wall. The AF assist beam is functional within its range: 2'-32.8' (.6m-10m) in the center, 2'-16.4' (.6m-5m) at periphery. The 580EX II's AF-Assist Beam is aligned with the focus points on all of Canon's EOS bodies - with 1, 3, 5, 7, 9, or 45 AF points. The Canon Speedlite 580EX II Flash can control (master) and be controlled by (slave) compatible Canon Speedlites as well as the Canon ST-E2 Wireless Transmitter for a very portable and flexible lighting system. This is a powerful feature that I use a lot. The 580EX II is able to control ratios in up to 3 groups (A/B/C - C is for background light only) and is able to enable/disable its own flash in the mix. Note: Even when disabled, the master flash will fire a preflash - making it appear to be enabled. 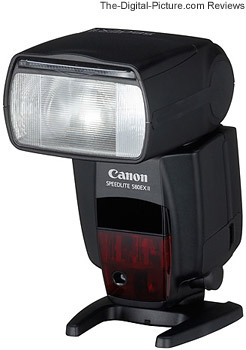 Canon Speedlites use light (not RF) from the flash head for simple wireless flash communications. FEC, High Speed synch, FE Lock, FEB, manual flash and Stroboscopic flash settings on the master flash are automatically set on the slave flashes. This is basically a line-of sight system though indoor use can include non-line-of-site remotes if the light bounces off objects in the room sufficiently to communicate with the remote flash(es). The transmission range for wireless communication are (periphery-center) 39.4'-49.2' (12m-15m) indoors and 26.2'-32.8' (8m-10m) outdoors. The extents of periphery wireless reception are +-40 degrees horizontally and +-30 degrees vertically. Four slave channel IDs are available to avoid conflicts with other photographers. External flashes such as the Canon Speedlite 580EX II Flash are one of the most popular accessories among Digital SLR (and film SLR for that matter) owners. Why? Why use an external flash? The answer may be obvious to owners of camera bodies without a built-in flash, but not so clear to those using bodies with a built-in flash. The built-in flash is great for fill flash to light the shaded areas (such as people's eyes) in a pictures. To use fill flash, set your exposure for the ambient light, then dial in -1 to -2 EV FEC (Flash Exposure Compensation). The built-in flash is also useful for adding catchlights (sparkle) in a subject's eyes. The next most-obvious answer is to raise the flash high enough from the camera that the lens and lens hood do not block the light - creating shot-ruining dark half moons in pictures. Because the light source is very small and is located very close to the imaging axis, using the built-in flash as a main light often results in a harshly-lit picture (often with red-eyed subjects). Items close to the flash are often overexposed, the background often becomes black, harsh shadows typically abound and subjects tend to become flat looking. I use direct-flash-as-main-light (typically in "M" mode) only as a last resort, much preferring to use a higher ISO, wider aperture, slower shutter speed, image stabilization, tripod ... But, sometimes there is no choice - it is simply too dark, the subjects are in action ... In this case, you simply must use the flash for the main light. But, this does not mean the flash must be fired directly toward the subject. The better grade accessory flashes feature tilt and swivel heads which allows them to redirect the light toward a larger white (or other similarly-neutral-colored) reflective surface such as a ceiling, wall, piece of white foamcore, commercial reflector ... Thus, the main light becomes the wide reflecting surface and the broad light source creates a much softer, less flat and far more pleasing image. The swivel and tilt features allow the 580EX II to be aimed as desired. In addition, a huge range of flash modifiers can be used with accessory flashes to create a broader lighting surface for direct flash, bounce flash or a combination of both. Getting the flash out of the camera hot shoe is a great step toward better flash pictures. Using an E-TTL compatible Canon Off Camera Shoe Cord OC-E3, mount the 580EX II on a flash bracket. This allows specific placement of the flash in relation to the camera. Keeping the flash mounted higher above the lens to send the subject's shadow lower - where it is not as unpleasant. A bracket is also useful for macro photography. The wireless remote capability of Canon's Speedlite flashes (discussed above) offer even far greater advantages. An accessory flash can be mounted in a softbox or umbrella for superb lighting. Multiple wireless remote flashes can be setup for a highly portable, complete professional lighting setup. Visit the links at the end of this review for more ideas and information on off-camera flash use. An additional significant reason to use an external flash over a built-in flash is the amount of lighting output the external flash can provide. For example, the EOS Rebel XT/350D DSLR's built-in flash effective range (Guide Number) is 42' (13m) vs. up to 190' (58 m)(ISO 100 at 105mm) for the Canon Speedlite 580EX II Flash (same as the 580EX). Wider lenses will have a shorter effective distance, for example ... The Canon EF 50mm f/1.4 USM Lens has a range of approximately 98.4' (30m) with the 580EX II. Once you know why you need an accessory flash, the decision becomes "Which one?" The Canon options in my opinion are the Canon Speedlite 430EX Flash or the 580EX II (or possibly a used 580EX). Canon makes a Speedlite 220EX, but it is rather featureless - good mostly for fill flash. One of the primary differences between the 430EX and the 580EX II is the amount of light each can provide. The 430EX has a Guide Number of 141' (43 m) while the 580EX II has a Guide Number of 190' (58 m) (both at 105mm). The 430EX is not under powered for many uses, but the 580EX II's significant power advantage can become important when using a flash modifier such as an umbrella, softbox or diffuser - or bouncing light off a high ceiling. In addition to being more powerful, the 580EX II allows 1/1 (full power) to 1/128 power in 1/3-stop increments while the 430EX allows power settings from 1/1 to 1/64 in more granular 1-stop increments. The other primary difference is that the 580EX II can be used as a master to trigger remote Canon wireless slave flashes while the 430EX can only act as a slave flash. Any number of Canon 430EX , 420EX, 580EX II, 580EX and 550EX Speedlites can be combined as slave units but only the Canon 580EX II, 580EX and 550EX Speedlites can act as slave masters. In addition, the Canon Macro Ring Lite MR-14EX, Macro Twin Lite MT-24EX, or Speedlite Transmitter ST-E2 can be utilized as wireless slave flash masters. Many people start out with a Canon Speedlite 430EX Flash (or started out with 420EX) and later move up to a 580EX or 580EX II. The 430EX can then be used as a remote flash. Those using Canon bodies with 45 focus points (1-Series bodies) should take note that the Canon Speedlite 430EX Flash's AF assist only covers up to 9 focus points. You can still utilize the 430EX's focus assist, but need to know that all focus points are not covered as in the 580EX II. The fact that the 580EX II can be powered from an external power source will be important to photographers expecting heavy flash use. The 430EX does not have this capability, nor does it have the PC terminal. While the Canon Speedlite 430EX Flash head moves up/down from 0 to 90°, left from 0 to 180°, and right from 0 to 90°, the 580EX II allows an additional -7° down and a full 0-180° rotation right. While both flashes feature a pull-out/flip down wide angle diffuser to cover lenses out to 14mm (FOVCF equivalent), the 580EX II includes a white plastic pull-out catchlight reflector panel in addition. The Canon Speedlite 430EX Flash features 6 custom flash function settings, the 580EX II features 14. Instead of a dial for adjusting settings, the 430EX utilizes rounded parenthesis-shaped buttons. I can understand making buttons safe from accidental changes, but these buttons are narrow and require an excessively deep press to make changes. The dial is much easier to use. If any of the 580EX II's advantages are important to you, buy the 580EX II. Otherwise, the 430EX is a very nice flash as well. It is about 15% lighter and more than 25% smaller in overall volume. Perhaps most important is that the Canon Speedlite 430EX Flash is less expensive. The 580EX II comes in a nice nylon padded case (similar to the case the 430EX is shipped with, same as the most recent 580EX flashes shipped with, nicer than the vinyl case the first 280EX flashes shipped with). The hook & loop closure is not as robust as I'd prefer. Also included is a slightly-modified-from-the-580EX shoe stand for remote flash operation. the bottom of the stand is threaded for mounting on a stand. 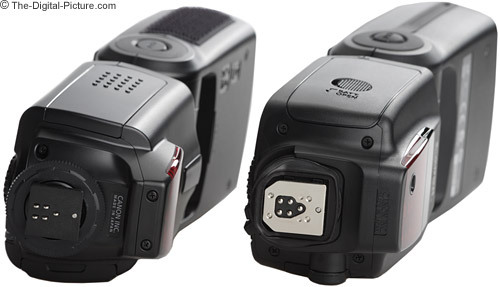 The Canon Speedlite 580EX II Flash's official dimensions are 3.0" x 5.3" x 4.5" (76mm x 134mm x 114mm). Official weight is listed as 13.2 oz (375g) without batteries (4 AA alkaline batteries add 3.5 oz/100g). If you want Canon's most powerful and most-capable flash, the 580EX II is it.